The CEA recently conducted a study to figure out how many people will be affected when analog broadcasts are no more. (We're still taking bets as to whether or not that day will ever truly arrive.) Their research determined that about 12 percent of the 285 million TVs in the U.S. receive programming via an over-the-air signal, while 94.4 million TVs are connected to a cable box, satellite receiver, or both. Twelve percent may not seem like a lot, but that's about 34 million TVs owned by people who clearly don't want to pay outrageous monthly fees to watch bad reality shows and sitcoms. Go figure. While a majority of American households will do just fine upgrading to an HD monitor that they can connect to a cable or satellite box, over-the-air loyalists are better off buying a dedicated HDTV with an internal ATSC tuner. That way, they can continue to tune in the major network channels without writing a monthly check. The JVC LT-32X776 fits this bill nicely—and it just so happens to be an LCD flat-panel, to boot. This 32-inch, 1,366-by-768 model features ATSC and NTSC tuners, and a twin-picture PIP function allows you to view HD and SD sources in their correct aspect ratios simultaneously. Through the ATSC tuner, HD content looks clean and rich, with natural colors and good detail. Combined with a Terk HDTVi indoor antenna, the tuner quickly and consistently picked up and held onto all of the major networks broadcasting in HD in my area. I actually forgot that I was watching over-the-air TV at times, since the picture didn't lock up or disintegrate before my eyes every few minutes—something no other ATSC tuner I've tried has accomplished. Naturally, the primary reason the over-the-air HD signal looks so good is because the LT-32X776 gets the performance fundamentals right. You can choose between four picture modes (Dynamic, Theater, Natural, and Games) and two color-temperature settings (High and Low). In a strange move, the picture modes aren't selectable through the menu; you change them using the remote's Video Status button. Our tests showed that the High temperature setting in the TheaterPro picture mode was the most accurate through both the component video and HDMI inputs. The color temperature was similar before and after calibration; neither of them consistently tracked at 6500 K, but neither was too far off the mark, either. It's not mandatory that you calibrate this TV. Not surprisingly for an LCD, the LT-32XS776 is quite bright, so it's a good fit for daytime viewing in a bright room. The black level is solid, as well. Like many LCDs these days, this one has an adjustable lamp setting, called Energy Saver Mode, that brightens or darkens the image. This one goes one step further by allowing you to adjust the lamp in increments from –30 to +30 to achieve the desired balance between brightness and black level. I got the best contrast ratio at zero, but it's nice to know that you can improve the black level in a dark room if you want to. Our tests showed a black level as low as 0.064 foot-lamberts and as high as 0.193 ft-L. Press the remote's TheaterPro button, and it automatically lowers the lamp to –10. JVC also incorporates two technologies called Dynamic Gamma Control and Smart Picture that evaluate light and dark images and adjust them for optimal contrast. While these are effective, they also create a floating black level that was more obvious with test discs than with real-world material. Even when you turn off DGC and Smart Picture, the black level still appears to shift a little. The LT-32X776 has a respectable viewing angle; the image is less saturated when you move off-axis, but it's still rich enough to remain enjoyable—and better than some other LCDs I've seen. The screen has a couple of light-uniformity issues; I could see a little light spilling onto the upper-right and bottom-left corners, which was most evident when watching darker scenes, especially at night. It's not bright enough to completely wash out those parts of the screen, though. Natural Cinema is the name JVC has given to its 3:2 pulldown detection. In the default auto mode, it was slow to pick up the 3:2 sequence on both the Video Essentials and Silicon Optix test discs, and it struggled with my demo scenes from Gladiator and The Bourne Identity. When I enabled the Natural Cinema function, using the button on the remote, the TV picked up the 3:2 sequence much more quickly, albeit slower than a good progressive-scan DVD player would have. In both modes, the JVC handled video-based signals very well, creating only minor artifacts. All of the performance parameters above combine to produce a good-looking image through both the component video and HDMI inputs. Still, I'd have to say that the HDMI has the overall edge for one simple reason: The picture is smoother, with fewer appearances by my favorite friend, digital noise. Through the component input, solid colors and black-to-white transitions were sometimes patchy or pixellated. Video Essentials' quantization test revealed that the LT-32X776's ability to transition from light to dark is only average, so the TV struggles when it tries to render a completely smooth gray. The amount of noise varied greatly depending on the quality of the source. HD content from my cable box was above average, but I didn't feel that the JVC upconverted SD sources as well as other TVs I've seen. Basically, when the signal quality is good, the picture looks good. When it's poor, this TV doesn't do much to improve it. When I mated the LT-32X776 with Yamaha's new DVD-S2500 universal player, which features an HDMI output, the resulting picture was rich, detailed, and surprisingly smooth without looking unnatural. Beyond its attractive HDMI picture, the LT-32X776 has a number of other digital-friendly features. To go along with the ATSC tuner, it has an optical digital audio output to send the Dolby Digital 5.1 signal to your A/V receiver. It also has two iLink ports that allow you to connect a digital or HD camcorder or, better yet, a D-VHS player. A CableCARD slot rounds out the package. Analog connections are limited, though. There's only one component video input and no VGA input. The remote control is backlit but difficult to decipher. It has a lot of buttons but no discrete input or aspect-ratio buttons. You can't see through the onscreen menu or move it around the screen, which makes setting up the TV harder. The menu is easy to understand, but there are no submenus, so you have to scroll through one continuous menu to get to the feature you want. This 32-inch TV has a small form factor and a simple aesthetic that I appreciated. The speakers run along the bottom, and the basic black frame doesn't detract from the image on the screen. Connections are easily accessible yet still discreet, with half of them running down each side of the inset back panel. You can hide the connections using removable plastic panels, if you wish. Lastly, the adjustable stand lets you angle the screen at an optimal position for your seating area. In all, the LT-32X776 is a very good performer that's ideally suited to someone who can make the most of the TV's digital offerings: HDMI, iLink, over-the-air ATSC, and CableCARD. If you're ready to embrace the digital age, the LT-32X776 is here to help. 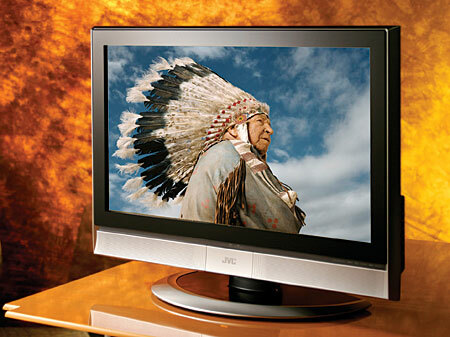 The LT-32X776 renders attractive HD and DVD images. The adjustable lamp settings, solid viewing angle, and slim form factor give it a versatility that befits many different viewing environments.